I have recently noticed that people’s basic philosophy of life can be understood by observing the bananas they choose to put in their carts at the grocery store. No, I haven’t “gone bananas,” thank you very much. Jeez, stop punning around and read carefully. This is an important and serious topic. The results of my (unofficial) research indicate that there is a direct correlation between the color of the bananas people choose to buy and their perspectives on life. People who buy bunches of very green bananas are highly optimistic. They believe that they won’t be dying any time soon; stepping out in front of a bus on the way home from the store is not going to happen to these people. They are confident they will be around to watch those bananas ripen and to eat those golden yellow bananas in a leisurely, relaxed manner. Life is long, man; ripe bananas are worth waiting for. Then there are the people who buy bunches of bright yellow bananas. They have a carpe diem philosophy. 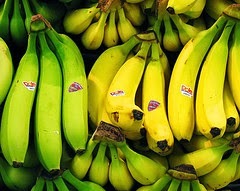 They’re all about not bothering to wait for green bananas to ripen when they can buy them ripe and eat them right away. Life is short, man; don’t deny yourself the joy of eating a perfectly ripe banana today. Finally, there are the people who buy bananas that are yellow with a couple of brown spots already mottling their skins. These people are highly pessimistic. For heaven’s sake, within hours, those bananas will be rotten! These people must actually doubt that they will make it home from the store at all. Life is fleeting, man; eat your bananas now! So what does your banana purchase say about you? You just may be surprised by the answer!